Purchasing power of the US dollar is a dry topic but it directly shows why you would want to have some gold under your mattress. So, grabbing an overall picture of the dollar’s shrinkage is a must. All right, look at the graph above. What happened? The purchasing power of the dollar since 1913 shrank significantly. In fact, in 2016, a little more than a century later, its purchasing power is less than 2 cents of that in 1913. For your reference, a purchasing power is simply how much goods and services a single dollar can buy. Hence, do a quick calculation and you can see that in last 103 years the dollar lost more than 98% of its purchasing power. Because the dollar lost so much purchasing power, the amount of goods and services you could have bought with a single dollar in the past is drastically different from what you can buy with it today. A hypothetical example. 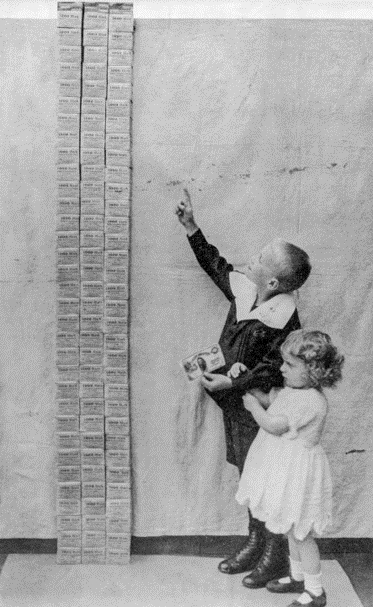 In 1950, with a $20.00 bill you could have bought a week’s supply of food for a family of four. In 1970, this amount would last only four days. Today, $20 would last just slightly more than one day. The graph makes it easy to see that as decades go by the amount of food a single dollar can buy decreases. In other words, the value or worth of the dollar goes down. Wondering why the worth of the dollar is dissappering? Ever increasing amount of dollars in circulation is to blame. Remember that like all other currencies nowadays, US dollar is a fiat currency because it can be made in unlimited amounts? The more dollars created, the less valuable they become. The pattern is similar to the pattern of most things in life – the more something is widespread, the less it is valued by people. Consequently, to adjust for the decreasing worth of the dollar, goods must be sold for more to make a profit and thus you pay more. If in 1950, a $20.00 bill was enough to feed a family of four for a week, you needed $32 to buy the same amount of food in 1970. 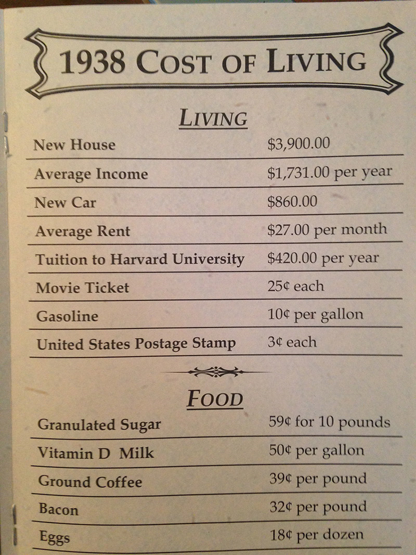 Whereas today you would need $200. The rise in prices as a result of value shrinkage is called inflation. Everybody experienced inflation first-hand, but not everybody realizes it. Just recall how cheap a movie ticket used to be 10-15 years ago! Thinking why more dollars created at the first place? The most innocent one is to replace old, damaged or counterfeited paper bills. However, this doesn’t create more dollars as undesirable ones are taking out of circulation, so the net number of dollars stays the same. Another reason is to account for the growing population. The more people there are, the more paper bills are required to conduct transactions. Again, this doesn’t create more dollars as the number of paper bills per one person stays constant. One is to pay off government debt or government spending such as public works I talked about in Life cycle of money post. The other is to counteract the slowing down of the economy. The slowdown of the economy or recession is simply a decrease in GDP*. In the last years, US printed money more to fight recession rather than anything else. How on Earth money printing alleviates inflation? The mechanism seems convoluted but the way it works is no more serious than a children’s money game. First and foremost, all banking matters of US and many other countries are managed by national or central banks. When central bankers see that the recession is deep and other measures don’t seem to work, they start to print, or more correctly, create money electronically. Very quick, just with a keyboard and mouse. Then they use this electronic money, literally created out of nothing, to buy bonds from financial institutions. Two examples of such financial institutions are a commercial (for profit) bank and a pension fund. When a central bank buys a bond, say, from a commercial bank, it simply means that it lends money to this commercial bank. In return, a commercial bank promises, in writing, to pay regular interest on the borrowed amount plus eventually pay it back in full. Because now a commercial bank owes money to a central bank, a bond is also called “I owe you” or IOU. Once a commercial bank has more money, it can afford to reduce interest rates. Low interest rates encourage businesses and individuals to borrow more. Consequently, now that they have more money at their disposal, businesses can invest more and individuals can spend more which creates demand in goods and services. Thus, more goods are produced and more services are carried out, that is, GDP rises and economy takes a step upwards which is the ultimate goal. Ideally, this is the way central bankers want “money printing” to work. The economic term for creating new money is quantitative easing. For example, in attempts to escape the 2008 recession, US carried out three rounds of quantitative easing: in 2008, 2010 and 2012. Quantitative easing is happening not only in US though. Every country, every year creates more money, paper, digital or both. I am talking about the US dollar because it is the most used, and therefore the main, reserve currency nowadays and almost all other existing currencies are pegged to it. Moderate “money printing” might not do much harm on the short term but it does on the long term as evident from the graph. On the long term, “money printing” causes the decline in worth of the currency and rise in prices, that is, inflation. On the other hand, too much “printing” over short period of time may result in near-immediate significant drop of value in currency and thus a sharp rise in prices and known as hyperinflation. Probably the best known example of hyperinflation is the Weimar Germany during 1922–1923 and the most recent is Zimbabwe from 2007 to 2009. So, by now you should realize that inevitably, bit by bit and year by year, money printing results in decline of the dollar worth and rise in prices. Roughly speaking, if salaries were adjusted for inflation, you could have ignored all the fuss with the shrinking dollar altogether. However, the minimum wage has been lagging behind inflation. Still, if salaries indeed were decently adjusted for inflation, your savings would not escape its discouraging effects anyways. I’ll quickly illustrate how inflation eats away your savings. In US, from 2006 to 2015, the average annual inflation rate was about 2.0%. It means that on average, each year prices of goods and services rose by 2.0% from the previous year. Suppose that this is an average for the next 10 years as well. If today, in 2016, you put $1000 in a jar without investing it anywhere, by 2026, you would have $820. You lose $180 in purchasing power due to inflation. Even if you do invest this amount somewhere and receive, say, 1.5% interest annually, you would still lose $48. This amount you lose might not be a lot but if you save more and for a longer time, it would. But the most outrageous and insulting thing is that you put effort into acquiring this money while virtually zero effort is required for a central bank to print it. The net result is government taking money from you, which, if translated into time, hours of life from you. Besides, there are evidences that the real inflation rates are higher than reported in the official sources. The disheartening dollar shrinkage would be less possible if the dollar was backed up gold. “Less”, because in case of US, it printed more money than there was gold even when the country operated on the gold standard until 1971. US likes to trick the world… but not without repercussions. Technically, under the gold standard governments cannot increase currency supply without also increasing the amount of gold in the vaults. Finally, inflation definitely would not affect you if you bought gold for the amount in the above example and put it under your mattress. You would not lose. Whether you would gain is another discussion and I’ll leave it for the future writings. Yeah… today I didn’t make a lot of references to gold, which makes talking about economy pretty boring. To tell the truth, it took some patience and time to write this post. Well, more gold calls next time!